Happy New Year. I hope you all had a fun and safe time (and maybe you got a chance to go to the parties I had listed in a previous post). Here is my third and final look for utilizing your suits to their maximum potential. The suit I was basing these looks off of is from Addition Elle. Its a classic grey pinstripe, with a boyfriend jacket. I used just the pants for this outfit (size 16), and I wanted it to be fun/funky. I also apologize for how awkward these photos are, it was -30 C outside, and I was trying my best to look calm as my body slowly froze. The top I wore is a bell-sleeved top is from Le Chateau (size XL). It is a cotton blend, and I was blown away with the innovative, secret button in the shirt between the two bust buttons. Its comfortable, and has a little bit of stretch in it. These adorable pink shoes are from Call it Spring. I knew I wanted to wear them with this outfit, even before I had picked a top or any other accessories to go with it. They have a furry (synthetic fur) front strap, and a short block heel. 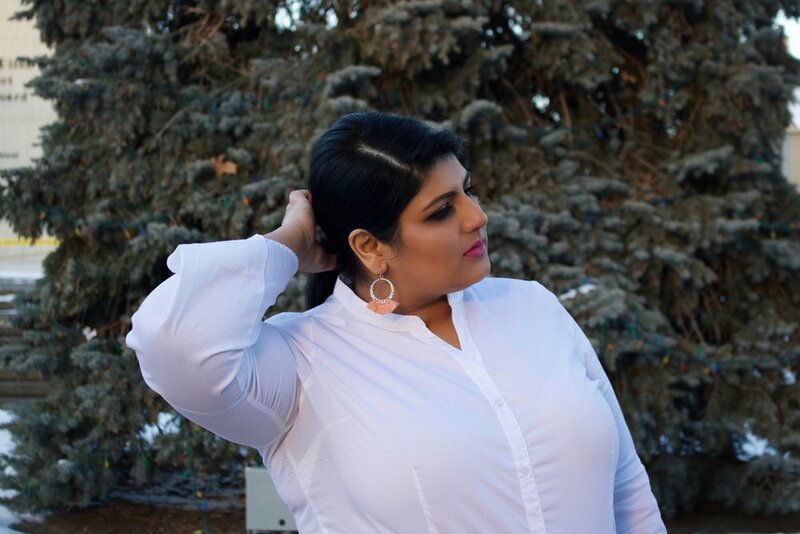 I found these earrings at Reitmans, and I thought they worked perfectly with the shoes, as well as the vibe of this outfit. 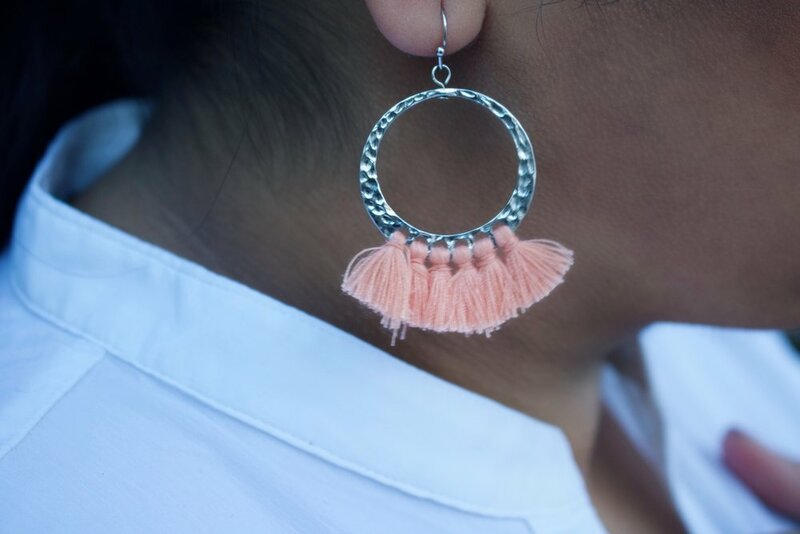 They are a classic silver hoop, with little peach toned tassels hanging off the bottom. I hope you guys enjoyed this look! Send me an email, and let me know what look was your favourite out of the three suit looks.